Michael Schumacher apologised for his conduct in qualifying but maintained his innocence after finishing fifth in the Monaco Grand Prix. The Ferrari driver was stripped of pole and demoted to last on the grid after stewards said he stopped to prevent his rivals setting a faster time. "Anyone who thinks that I deliberately wanted to wreck [Fernando] Alonso's lap is wrong," said Schumacher. "And to those who think that, I can only say 'I'm sorry that it happened.'" Stewards ruled on Saturday that the seven-time world champion deliberately stopped at the slow penultimate corner of the track in the dying seconds of qualifying. "That was certainly not the intention because I was not even aware of where Alonso was," said the 37-year-old Schumacher. "We didn't have radio contact and I did not have any knowledge of who was driving out." Schumacher said his car locked up after running wide at the Rascasse hairpin and then stalled, making it impossible for him to get out of the way. The German, who remains second in the championship - albeit 21 points behind Monaco winner Alonso - set the fastest lap of the race as he moved through the field after starting from the pit lane. "I'm used to living with criticism and in certain situations you just have to live with it," said Schumacher. "I think that there is a lot of prejudice involved, because no-one was really sitting in that car and knew how and why everything happened as it did. "Without knowing the situation we had and what I felt, no one else is really in a position to accurately judge what happened from the outside. "I have to admit that certain things must have looked a bit curious from the outside but there were reasons for that and I don't really want to elaborate on it. It's not really anyone else's business either." 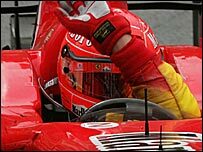 Schumacher, five times a winner in Monaco and the most successful driver in the history of Formula One with 86 wins, admitted his career had been peppered by highs and lows. "Everyone's got some spots on their clean vests," he said. "I believe that I've had for the most part a clean vest in the 15 or 16 years that I've been in Formula One and there are perhaps a few darker points in there where some may dispute or criticise things. But I can live quite well with that." He added: "Those who opened their mouths and made their snappy comments are now certainly too chicken to come to me and talk to me one on one. "The others who are more reasonable have come up to talk to me about it. "It's like anything else in life. You can't only have friends. You've got those who envy you and are foes. You've got to come to terms with that. Why should it be any different than in real life?"